Crown molding is one of the cheapest and fastest ways to improve the look and feel of a room. Installation is within the reach of the homeowner. Things can, however, get tricky. After completing a large project myself I can offer some insight that will make your project go faster. Unless you plan on flat-cutting crown molding, the molding must be cut at an angle and upside down. I have found that it is impossible the accurately position the molding on the miter saw without the help of a jig. Aligning the molding by feel is not accurate enough. Even small errors of a degree or two out of square will translate into visible gaps in the finished product. Both inside and outside corners are affected. After producing half a room's worth of bad joints, I decided to build a jig from two pieces of plywood and a guide strip. The plywood walls represents the wall and ceiling. The guide strip accurately positions the trim such that the molding's projection is just right. Glue and nails hold the jig together. With this jig cutting becomes a snap. Insert the molding upside down, press down to position it correctly, set the correct miter angle, and make the cut. You'll not only produce better joints, you'll also free up your mind to worry about making the cut safely. The jig covers the positioning part. Cutting errors are a frequent occurrence when starting out. It does not have to be this way. There are only four different cuts you'll need for a crown molding installation: left and right side of an outside corner, and the left and right side of an inside corner. 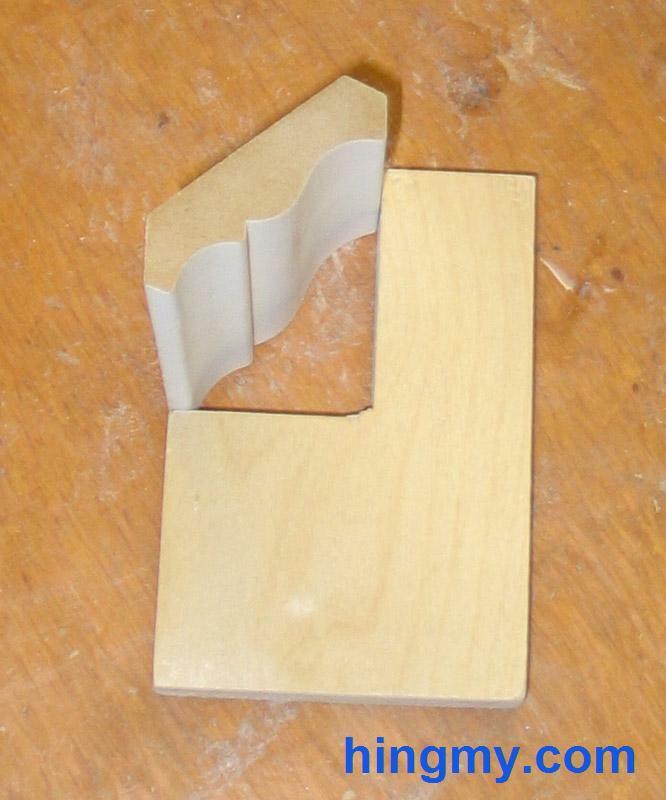 If you are working on a large room, you might want to add templates for a lap joints. I keep a template of each type close to my miter saw. For every cut I pick up the template and visualize it on the wall. This ensures I am making the right cut. 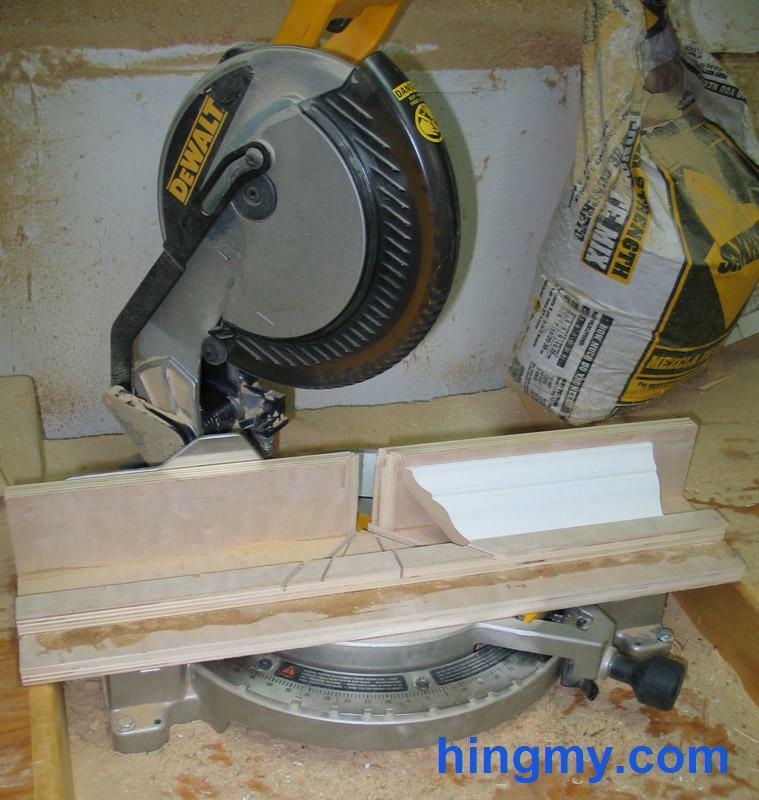 If I am unsure how to set up the saw for the cut, I insert the template into the cutting jig. It'll only fit one way. I set the saw to match the template and make the cut. You might laugh at the idea of creating templates for only four different types of straight cuts. Once the scrap starts piling up next to the saw, your opinion might change. These templates save time and money. Measure twice - with light! Measuring long walls, especially near the ceiling, is very hard to do with a tape measure. When working alone there are no real good options for creating an error free measurement. Professional finish carpenters have started to adopt digital measurement devices. Instead of a metal tape, these units use a laser to measure the distance. 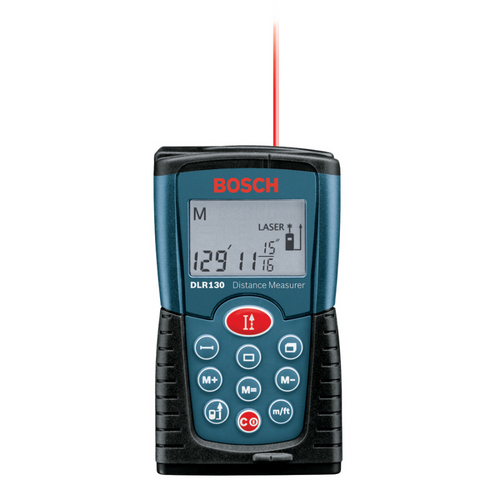 Simply place the device up against a wall, point the laser at the other side, and take a measurement. The device will produce and accurate reading within +/-1/16". That's much faster and more accurate than any tape can produce. I use a Bosch DLR130K for crown molding and baseboard installs. It performs flawlessly for these applications. I recommend a unit like this for even small jobs. It'll save you an hour or two, and remains immensely useful after the project is done. It's just as difficult to correctly align the molding on the wall as it is to do on the table of the miter saw. Again a jig solves the problem. A simple piece of plywood with a cutout of the height and projection of the molding is all that is needed. When the jig is pressed against the wall and the crown molding, the molding will correctly align itself. There is only one way it can fit. Correct installation is essential for tight fitting joints. While errors of a couple of degrees won't show in the middle of a run, they do create broken joints at the ends. If the center of the molding is installed incorrectly, the ends need to be twisted to correct the mistake. The molding will resist this. Installation becomes harder. 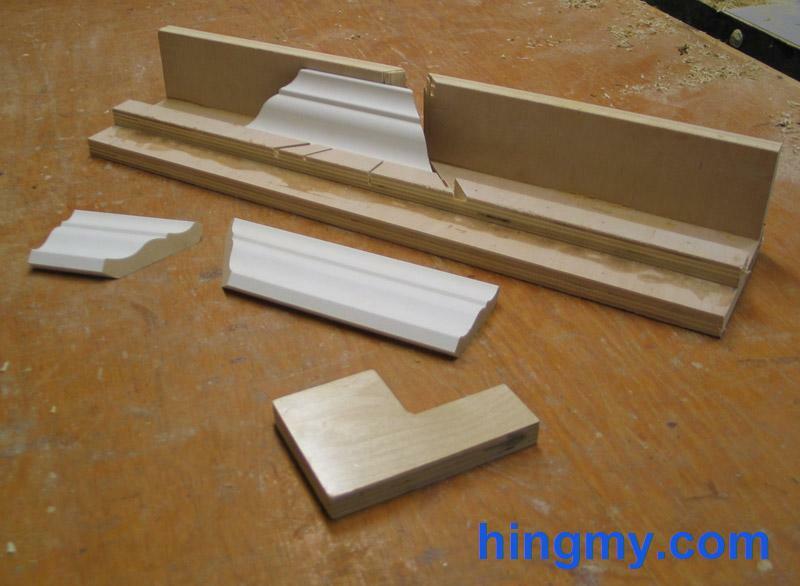 You can avoid all these problems by installing the molding with a jig. Once the center is aligned correctly, the ends will align themselves on their own. A good start creates a strong project. Installing 12ft pieces by yourself can be brutal. Not only do you have to worry about keeping the piece from falling, there is also joint to worry about on each end. I learned the hard way that it's best not to nail the ends of each piece until the adjoining piece is on the wall too. That way the projection of the ends can be adjusted to create a tight fitting joint. Even if you use the gauge and can install a piece perfectly to spec, the ends should still not be nailed down. Imperfections in the walls, ceiling, and the cope might make a slightly out of spec installation more visually pleasing than a perfect one. Don't nail the ends until the joints are tight. Just don't do it. Unlike caulk, wood putty dries solid and can be sanded. That makes it perfect for filling nail holes. Overfill each nail hole with putty, let it dry, and sand off the excess. Caulk remains flexible after it dries. It's much harder to level. For joints, caulk is the better choice. It's hard to get wood putty into the tight 90 degree joints. After the putty dries, it often separates from the somewhat thin walls of cope joint. Caulk, on the other hand, sticks to the walls. It's easy to push into the joint with a finger, and it remains flexible. Should the molding expand or contract as the seasons change, the caulk joint will move with it. Make sure the caulk you are using is paintable, even if you plan on not painting it. Eventually someone will repaint the walls around the molding. Having non-paintable caulk around is not an option. Installing crown molding can become very frustrating very fast. You are working with long, unwieldy piece above your head. Ever cut must be perfect, or you'll risk badly fitting joints. The key to success is eliminating sources of errors. Jig and templates for cutting, lasers for measuring, and templates for installation remove the most common and costly issues. The pros make few such mistakes, because they know how to make complicated task simple. When installing crown molding, I find it's best to do the prep work and work smart.